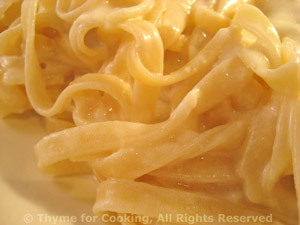 Fettuccini Alfredo, the Italian way, without heavy cream, Thyme for Cooking. The trick to this classic sauce is not the addition of heavy cream or lots of butter, but in the careful melting of the Parmesan. A bit of the cooking water is added to help the process. The end result is a thick, very creamy sauce that lets the Parmesan flavor shine. It's also much lighter than the typical version. Cook the pasta according to package directions, until 'al dente'. Drain, reserving a cup of the cooking water. Put the pot on very low heat and add the butter, mascarpone or yogurt and pasta. With 2 large forks start tossing the pasta like you would a salad. When the Parmesan is well distributed sprinkle the rest over the top plus 1 tbs pasta water. If / when the cheese starts to stick a bit to the bottom of the pan, add 1 - 2 tbs pasta water and scrape it off the bottom of the pan. Continue tossing the pasta, adding a bit of water when needed, until the Parmesan is melted and the pasta is covered with a thick, creamy sauce.